Get every NFPA® code and standard referenced by the IBC on one PDF! The 2018 edition of the International Building Code® (IBC®) references 400+ documents -- including more than 50 safety codes and standards published by NFPA. All are a legally enforceable part of the code. 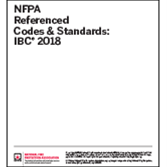 Order this PDF for convenient, unlimited access to every NFPA document referenced by the 2018 IBC, including NFPA 13, Installation of Sprinkler Systems; NFPA 30, Flammable and Combustible Liquids Code; NFPA 70®, National Electrical Code®; NFPA 72®, National Fire Alarm and Signaling Code® NFPA 80, Fire Doors and Other Opening Protectives; NFPA 99, Health Care Facilities Code; and NFPA 101®, Life Safety Code®.